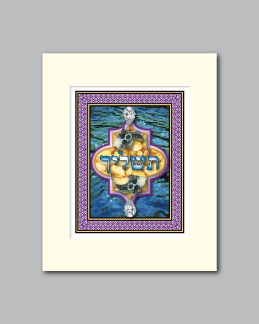 Jewish Holidays :: "The Purity of Water"
On the afternoon of Rosh Hashanah, or the Jewish New Year, there is a long-standing tradition called “Tashlikh” (תשליך) which literally means “casting off”. In this ritual, a natural moving body of water is visited. By throwing bread into the water and reciting certain prayers, the previous year’s sins are symbolically “cast off”. This art piece is an homage to this time-honored ritual. 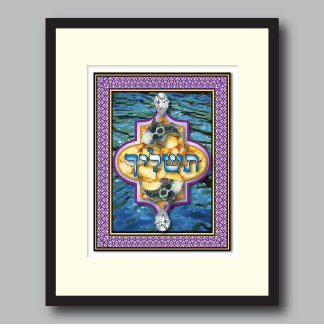 The background depicts the living water that accepts and washes away our sins. It is said that the fish eat the bread thereby eliminating our transgressions. 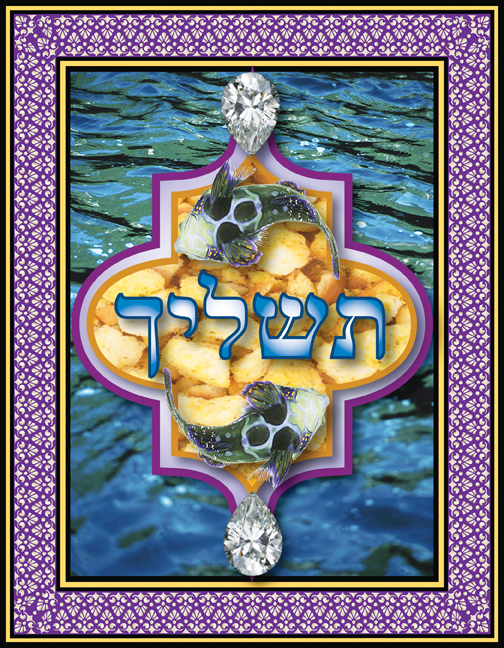 Fish also are the symbol for G-d who never closes his/her eyes and is always watching over us. The yin-yang formation of the fish reflects balance, and the duality of good and evil leading us to the ultimate desire for repentance. Finally, the diamonds at the top and bottom are symbols of our reverence and purity of heart and spirit.